Hidden within the cloud forests of Costa Rica’s Tenorio National Park, the magnificent bright blue Rio Celeste Waterfall will take your breath away! After doing some of the more typical tourist activities in Costa Rica like visiting Monteverde Cloud Forest and whitewater rafting in Turrialba, I wanted to find an activity that was a little more off the beaten path. I heard a rumor about a secret waterfall located in the North of the country, and decided it would be worth checking out. It was 5 hours by bus from San Jose to reach the town of Guatuso on the Eastern edge of the reserve. That was followed by an hour long ride in a local bus filled with little old ladies who stared at me the whole way. Once at the tiny village of Rio Celeste, it’s a 2 mile hike up the steep dirt road leading into Volcano Tenorio National Park. Planning a trip to Costa Rica? Click here for accommodation deals. After half a day of travel, drenched in sweat & ready to pass out, I finally made my way into the entrance of the park and paid $4 to hang my camping hammock in the trees. Access to bathrooms & showers was included, and they even had a small restaurant. Summertime is rainy season in Costa Rica, and the sky often opens up in the afternoons. Luckily I had my hammock set up before the daily deluge began. Although I did scare off at least 5 snakes in the process. The next few hours were spent lazily swinging from my dry cocoon while reading a book and listening to the family of howler monkeys screaming directly above me. Finally I threw in some earplugs and fell asleep. The next morning it was time to rise with the sun and began a journey into the forest in search for the famed waterfall. The 45 minute hike sent me through a scenic canopy of trees alive with curious white-faced monkeys, colorful red poison dart frogs, singing birds, and fluttering blue morpho butterflies. I couldn’t believe my eyes. It looked like something out of a fairytale story. A powerful river came crashing 60 feet down from the trees above into a dazzling pool of turquoise blue water. It created a cold mist that floated through the air around me. Rarely does my mouth drop open dumbfounded at the beauty of a place! Standing alone in the middle of an emerald green forest transfixed by this beautiful bright blue wonder of nature, I had another one of those special surreal moments that all travelers long for. I couldn’t wait to take a dip in that cold water! It felt great after my early morning hike. The intense color of the pool is created by volcanic minerals in rocks underneath. The rest of my day was spent climbing rocks and playing in the vibrant blue liquid. There is a pretty strong current at the base of the waterfall that pushes you away, so it’s impossible to swim too close to the powerful cascade of water. A few other people stopped by the falls that day, but for the most part I had this magical place all to myself. My adventure was complete with a dip in natural hot springs further up the trail. Have any questions about Rio Celeste waterfall? Are you planning a trip to Costa Rica? Drop me a message in the comments below! I’m wondering if you actually camped at Rio Celeste Lodge or were just suggesting them to other travelers looking for lodging. I’m having a hard time finding places to camp! Others are welcome to chime in. Hi Matt, unfortunately it’s prohibited to swim in Rio Celeste waterfall right now. They even built a fence around the pool. I believe it is due to someone died there 2 years ago but I’m not sure about that. My husband and I will be staying with family in Jaco for the month of May but want to take several day trips to other places. Rio Celeste is at the top of our list but we don’t want to stay the night or pay for a tour. We also won’t have a rental car so we’ll be relying on public transportation. 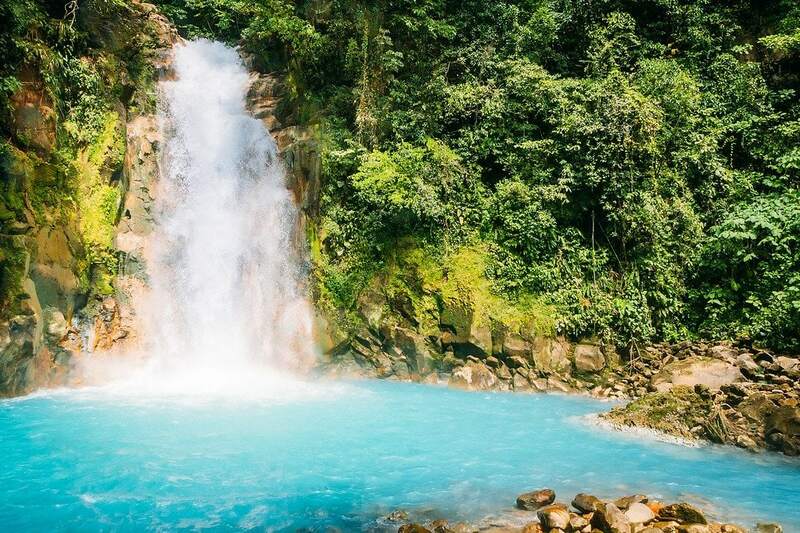 Would you recommend Rio Celeste to us, and how easy would it be for us to get transportation there and hike in to the waterfall and hot springs? About 8 years ago I spent a few months with a group of Aussies and Canadians working on the walking track to the waterfall. As you head up from the Rio Celeste town you’ll see a beating down shack on the right just before you get to the park entrance (that is where 12 of us lived for that time, or the cement floor). Well use to be there … I am sure other volunteer groups have used it since. It was an amazing experience, and we’d hike to the waterfall almost daily. There are hot springs along the way too. You could swim at the waterfall when I was there … it is amazing, and as you walk along the track you come across a section where the river meets another clear river. Seeing the colours blend is quite spectacular. Cool Pete! Rio Celeste waterfall is a special place. So beautiful. I know the meeting point of the rivers you mention, the colors are very pretty. Thanks for sharing and promoting this beautiful place in Costa Rica! I also volunteered in the national park about 14 years ago. My husband and I now run a small B&B close to the park! 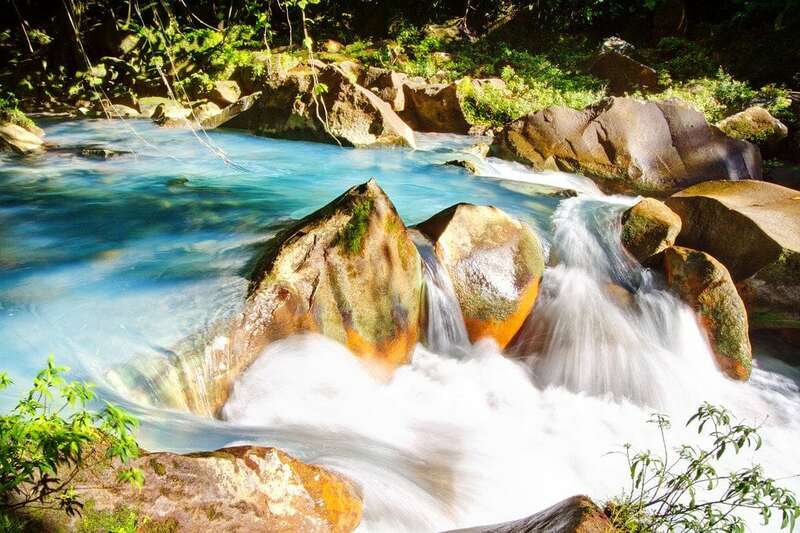 It’s a great place to explore the local area from… Rio Celeste is truly magnificent! Beautiful! Heading there next week, too bad it’s fenced off. But based on those pics it still looks worth it! Where exactly are the natural hot springs after the falls? Want to make sure I don’t slip in one that ends up cooking me! Hey I’m from Costa Rica and makes me feel really glad that you visit Rio Celeste and my country. I just wanted to tell you that some scientist found that the water looks that way because an optical fact and not because of chemichal matters. So it is just your eyes making you feel in the fairy tale. Here is the article that explains it. Thanks, Santiago. This explains it very well. I am planning to go to CR next week . Would you still recommend going to rio celeste falls after the fencing ( looks like this would take an entire day travelling from la fortuna ) or do you recommend doing something else ? We hopped the fence. The sign that said “no swimming” was on the floor. I joined the locals who had come from the other side of the waterfall. And I ended up taking the local way out of the park (which is free) and was one of the most insane hikes of my life, but just absolutely stunning. We drank spring water from the rocks and filled our bottles with it and after drinking that water… bottle water tasted like chrolox to me. Basically.. you guys can still swim if you’re brave enough to hope that tiny fence and climb down the rocks with rubber shoes :) It was one of the most amazing experiences of my life! What does this fence look like?? I am supposed to be getting married in front of the falls this July and am a little concerned now :/ We are traveling all the way from Las Vegas to CR, and then another three hours from our hotel to the falls. If you are anyone else has pictures of the falls with the fence that could be emailed to me I would greatly appreciate it!! We’re just wondering if we should find a new location. I plan to use the public transport available. Can you give some info on how to reach the falls from la fortuna ? Also we plan to hike this falls ourselves and not arrange a tour guide. I hope it would not be too difficult and that the trails are marked properly. amazing !!! I am planning to go to CR this november 2013 during thanksgiving week . Can this hike to the fall be done as a day hike from la fortuna ? or would you suggest renting some room close by ? I Ram, I would recommend renting a room overnight near by. Even with your own car, I think it takes 5 hours to get to Guatuso from La Fortuna. But there are reasonable places to stay overnight next to the park entrance. 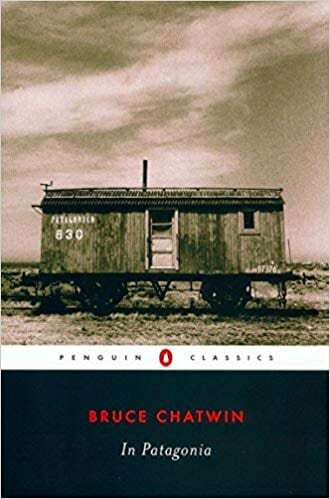 I’m just noticing now that the link to my directions on Lonely Planet no longer works… I’ll try to write them up again soon. From google maps, it says its about 48km from La Fortuna to Guatuso, so I can’t imagine it taking much more than an hour. :/ Am I missing something? 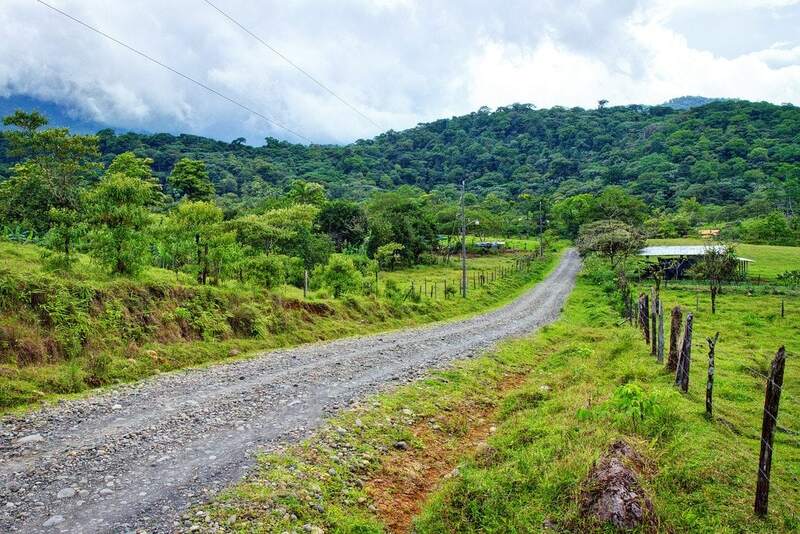 Hey, I am going to Costa Rica next week and after seeing your post we were hoping to get to Rio Celeste but am unsure how to get there without a car. There will be 3 of us and we will be coming from either Monteverde or Arenal. Any advice on busses or anything would be greatly appreciated! 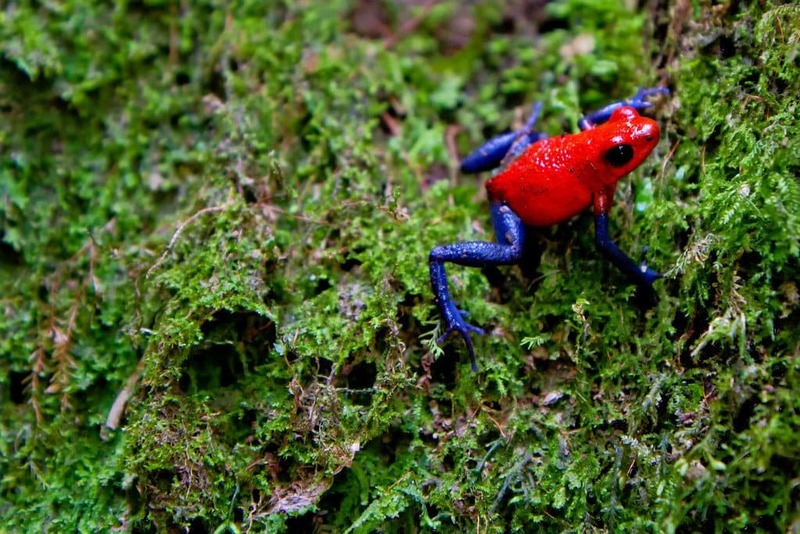 It would be wonderful if you could share your costa rica trip details . Were you able to find a bus to go to rio celeste falls from arenal ? Hey! I am heading to Rios this coming week. I have a really nice hammock but I do not have the rain fly. I can easily make one with a tarp if needed but currently its dry season in Costa Rica. But I always bring on when Im out anyways. I was wondering about the bug net. I do not have one. My hammock can wrap all the way around me, but do you think I would get eaten alive? Thanks!!! Hi Mia! To be honest I don’t know. I’m sure the amount of bugs changes with the seasons, and I can’t remember how many were around when I was there. But you can pick up a bug net in most towns for a couple bucks just in case. Matthew these pictures are just unreal. I have yet to travel to Costa Rica and really want to see the forests like you have been in them. The waterfalls just look like an amazing dreamworld. Your hammock topped it off for a really nice and relaxing place to take in all that beautiful nature. Thanks for sharing, I’m dreaming of going here now, for sure. What a great find! We may just have to find our way there, after we finish up volunteering at a Cacao farm in the Carribean. 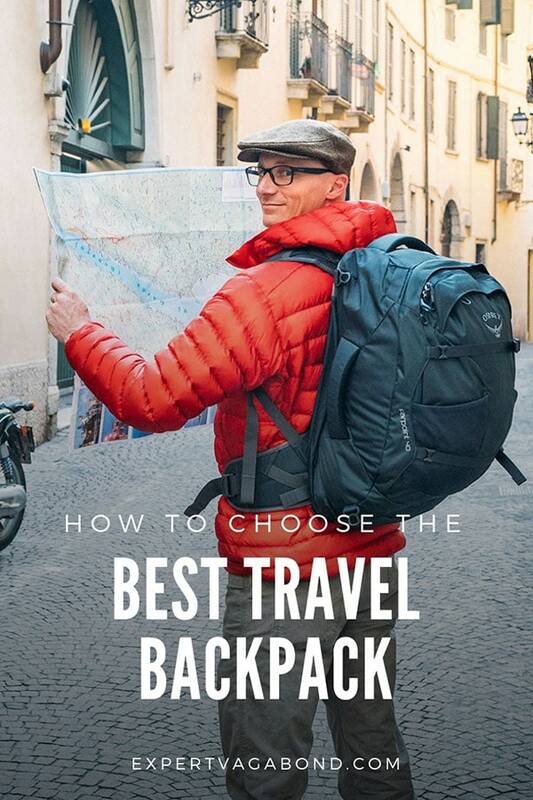 Also, I’m curious about which hammock and rain fly you use. 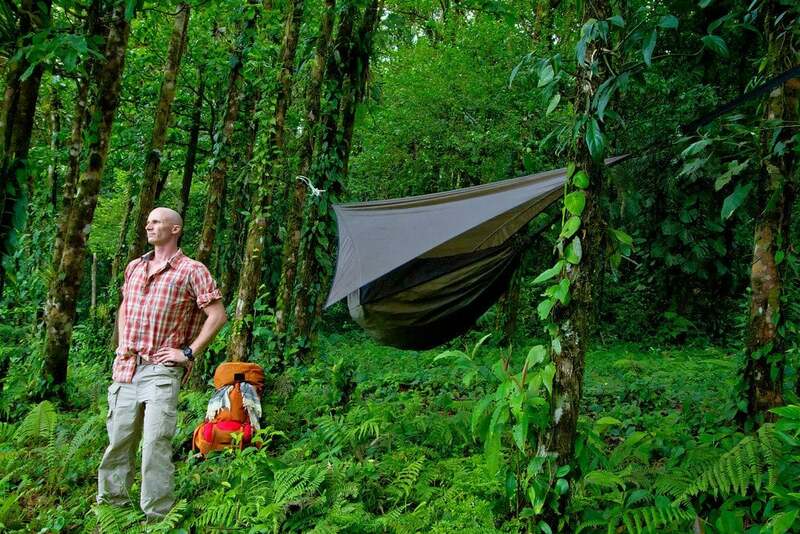 I’ve read mixed reviews of of using a tent or hammock in Costa Rica. Any advice from your experience? I love my Hennessy Hammock! I had it modified so the bug net can be zipped-out when not needed (a huge plus), but I think Hennessy has started making some new models with that feature included. Those pics def don’t look real. What a paradise. My fav is Alaska for travel. Our photos is fantastic and wild traveling is so horrible and adventure whole time. I’m going to costa rica with school in April. We’re going to this state park and I was wondering what type of pants to wear in the rainforest if you’re a girl? Personally, I like nylon/cotton blend pants. They’re lightweight, quick drying, but are also tough. Many people use straight nylon hiking or zip-off pants. Either would work fine. Just get something that will dry quick if you’re caught out in the rain. Any outdoor sports store like REI will have them. I am planning to visit Costa Rica with my fiancee end of this year, do you think having camping in Cloud Forest is a good idea for just both of us? Any recommendation on local tour arrangement? Yeah, it would be great! I think you can arrange tours with Rio Celeste Lodge. But you really don’t need to, it’s possible to do on your own. Uh-Ma-Zing. that is all. Oh, and I think I will be in CR for a month or so on my RTW next year, so marking this down, for sure! Yes, true. Amazing photos of this wonderful water and of the frog. UNBELIEVABLE! What terrific pictures, Matt! And I LOVE the video. I could almost feel the coolness of the water! Magnificent Matt! How do you get all those shots on video? I use a small tripod, and two different cameras. One of the cameras can be attached to my head with a strap, and it’s waterproof. The camera gear I use is listed here. Enjoyed your trip vicariously. The photos are just awesome. My favorite post of yours yet, truly magnificent and unbelievable!!! Wow! Amazing! Beautiful! Spectacular! Impressive! actually I don’t think words describe this kind of beauty and I am sure it was divine in person. Your photos should be in National Geographic. Matt, thanks so much for sharing your adventures. I love seeing where you are and learning about all the places you visit. I guess, YOU are now my teacher. Love how that works in the world. Be safe and keep smiling. I just came back from Canada and had a nice dip in Louisa Falls in Quetico Provincial Park. A sweet spot, but not as beautiful as this place. Great find. Thanks for the awesome website! The gear page and your emails regarding to hiking boots really helped me plan my trip to central America quite well. Unfortunately my adventure is over and im back to the real world but ill be living vicariously through you and your site! Glad you got some use out of it Jake! what a great find! That’s one of the prettiest waterfalls I’ve ever seen. I’m sure it was much more stunning in person too. Do you think if it’s a little bit too much crazy to go there with a child ? I don’t see why not… the trail to the waterfall is pretty steep & muddy in some places so that could be a challenge, but not impossible with a kid. The pool of water under the waterfall has a strong current, so that’s something to watch out for. Very cool! I am always amazed at the quality of your pictures and videos! Great little spot you found there in Costa Rica. How many hour round trip hike are these falls from the entrance?